Amla (Emblica officinalis) is a super food and only one small berry contains as much antioxidants as a basket full of assorted fruits. Amla buttermilk is an instant and delicious way to get a few super foods together in a mug. Affordable, local super foods. Every now and then a new super food floats into the market and everyone jumps to buy it and use it in their smoothies and to top their salads. Yes most of the super foods have great nutritional value but many of them come at a cost that our environment pays, thanks to these super foods being imported from one part of the globe to another in this market oriented food system. So if you are going to order Goji berries online at a hefty price tag, think twice and take a stroll into your local vegetable market instead. Please make an effort to find the treasures that your grandmother used to relish. You will find at least a few every time you go to your local vegetable market, wherever you are. Supermarkets stock only shelf stable produce, you may be missing a lot of valuable nourishment if you never consider shopping elsewhere. Indian Gooseberry or Amla or Aonla (Emblica officinalis) as it is called in local dialects, it is the most important Kaya kalpa (rejuvenation) medicines of Ayurveda and makes a lot of medicines in combination with other herbs. Amla contains all tastes (according to Ayurveda the six tastes are sweet, salty, sour, bitter, astringent, pungent ) except salt and thus relates to all the three humours (Vata, Pitta and Kapha) and balances them in the body. Amla is a strong antioxidant helping the body and immune system, and helps fight Ama or toxins in the body on all levels (source). Super food indeed, that too with high potency in small amounts. We make a chutney with boiled amla an another with raw amla and other ingredients, these chutneys are a great way to include the fresh herbs and amla in one's everyday diet. 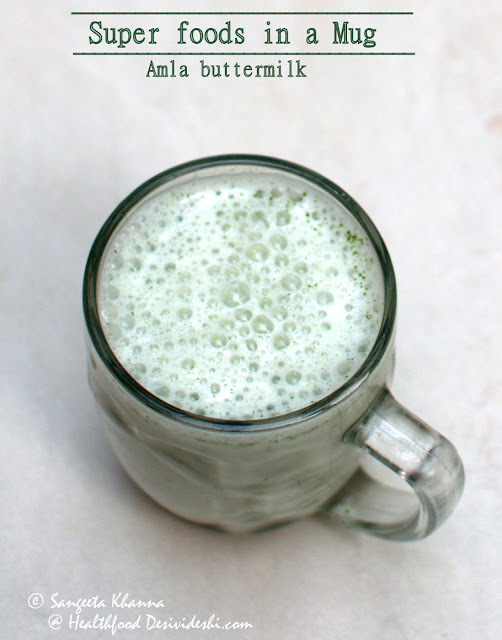 The buttermilk I am sharing today is a very delicious refreshing drink that packs five super foods not one. Yogurt, curry leaves, green chillies, ginger and amla all are super foods in their own right. Your grandmother knew it all, may be you have forgot what she talked about. May be you overlooked. Just use one amla per serving and add as much ginger, curry leaves, chillies and salt n pepper you wish and adjust seasoning as per taste. Have it chilled or at room temperature and see how you love this drink. I like using 4 mature curry leaf springs, one green chilli, 2 slices of ginger (as shown in the picture above) and one amla per serving and love what the result is. Let me know when you make this drink. If you don't get fresh amla berries in your part of the world you can use amla powder (1/4 tsp per serving) soaked overnight or at least a couple of hours. Amla powder is as potent as fresh ones but the taste may differ a little bit. Frozen amla is a better option if you have access to that. 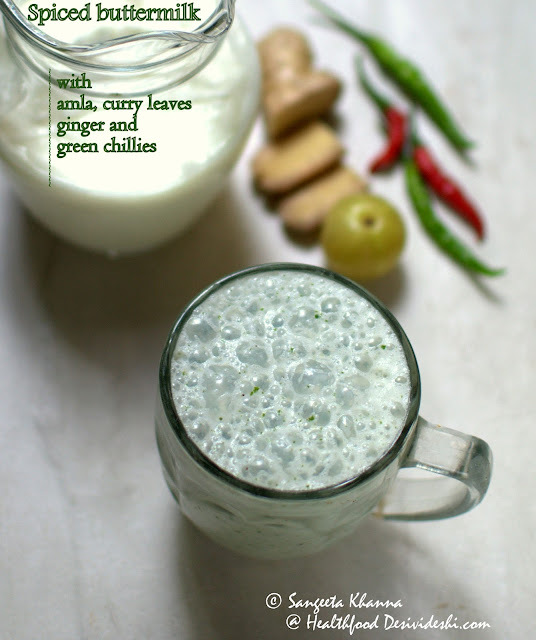 There is bottled amla juice available in the market too these days but using one amla everyday either in chutney form, or in this buttermilk will be much better as consuming amla in real form is the best way to get the benefits. Bottled juices may or may not be packaged rightly and must be consumed as the last resort. Note that this recipe is devised to supplement iron and calcium in the most absorb-able form apart from being an anti-inflammatory and antioxidant food. Super foods must nourish in multiple ways. What ways do you consume amla in your home? Please don't tell me about amle ka murabba. I want more savoury ways to consume amla every day. Please share your recipes and tips. A favourite way is to make a kind of raita (thayir pachchadi in tamil). Grate the aml, and run it in the smallest mixie jar with coconut and green chillies add curd and garnish with tadka of mustard and curry leave. My mouth is already watering :) I also replace lemon with grated gooseberries to make "goose berry rice"
Thanks Sugar, I do make the raita this way too but never tried adding coconut with amla. The most common amla raita I make with the same set of ingredients has a thinker consistency than this buttermilk with added finely chopped onions. All raw, no tadka. My mother makes amla badi. She puts amla in boiling water and takes out in a minute or two. Lets it cool, and then separates flesh and stone. The flesh is mashed and mixed with ajwain (carom seeds) and salt. Then she makes small badis, which are dried those in the sun. The dried badis are then gifted to family. We just chew these ... much, muc better than sugary murabba ... and are great to improve tastebuds. Hi Aditi no it is NOT a stupid question. In fact I should have mentioned that in the recipe. Will update it asap. 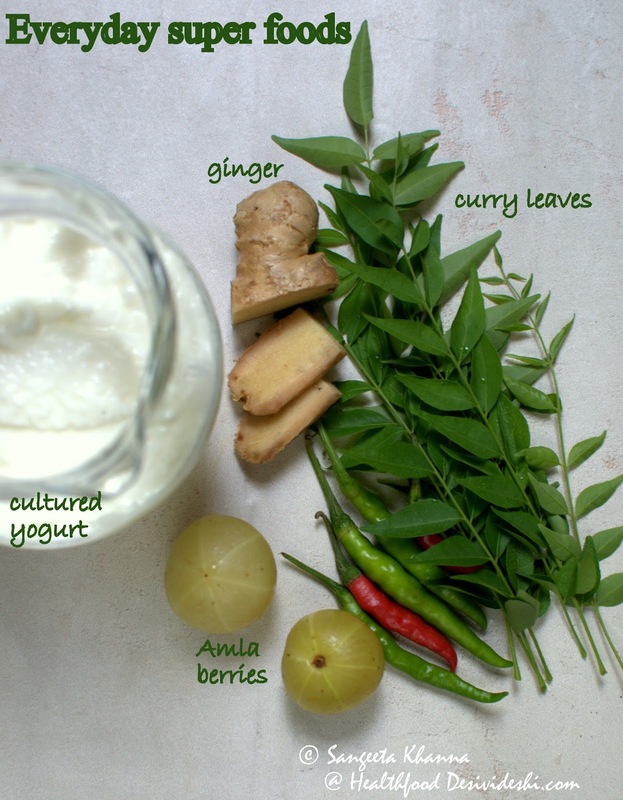 You just have to chop the amla in small pieces and blend along with ginger, curry patta etc. 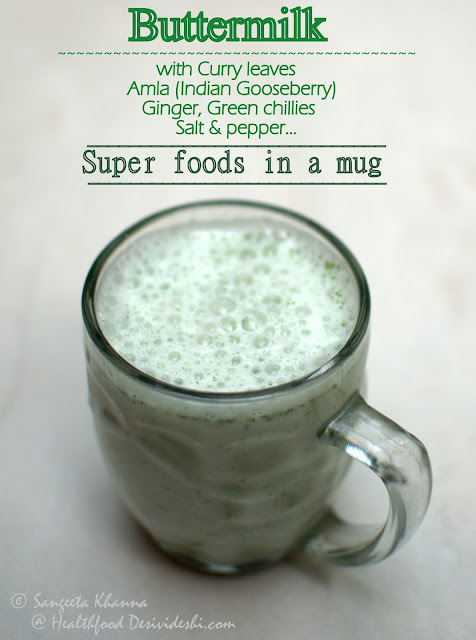 It is used raw in this recipe but there are more recipes on this blog where amla is used after boiling too. Please go through them and let me know if it is useful. 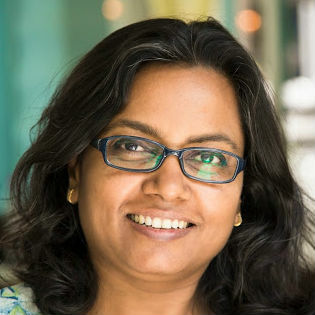 Hi Sangeeta, I am a regular follower of your recipes and all are just owesome. Very easy to make in no time, full of nutrients and above all very delicious. I tried this buttermilk and it tastes great. Thank you for so many good recipes.